Dave Kosanke is a Wisconsin-based fanzine publisher who conducted this interview with me in December 2008. We discussed some of the background regarding a feature length video documentary I wrote, produced and directed back in 1987 entitled Drive-In Madness!. Dave Kosanke: How did the Drive-In Madness! idea first come about? Tim Ferrante: I was vice president of Imagine, Inc., a Pittsburgh-based publishing company of horror entertainment. The partners were me, John (Jack) A. Russo, Bob Michelucci, Andy Schifino and Tom Savini. Savini owned a small percentage, but was not involved with the day to day and I rarely saw him. It's important to note that Imagine, Inc. was a going concern when Russo, Schifino and I bought out Bob's old partner sometime around 1986. I'd travel to Pittsburgh when necessary, but worked out of New Jersey even though I had full time employment with ABC-TV in New York City. I was also writing for Fangoria, its sister publications and several other publications at that time. I had a full plate. Drive-In Madness! (D-IM!) was a book awaiting publication. It was assembled by Bill George who already had a successful title with Imagine called Eroticism in the Fantasy Cinema. There was a pre-existing schism between Bill and Imagine and the book was in limbo. The headache for us was that it had been announced, advertised, orders had been taken and people constantly asked about when it was coming out. There's more detail to this, but suffice it to say that as a stop-gap measure to deliver something to fans called D-IM!, we came up with the idea of an original video program and I would be the one to make it happen. DK: The drive-in scenes were shot at the Wexford Starlight Drive-In. What's the background of this theater? TF: The Wexford Starlight Drive-In was located on Perry Highway (Route 19) in Wexford, Pa. and had an oldies night where vintage car enthusiasts would gather. It was Bob's car in which our two teen moviegoers were seen. All of the drive-in material was shot after I did a first edit. The original version was lacking something, although some would argue the final version is lacking something as well! I remember talking with Jack about an inexpensive solution. We discussed what was needed editorially and the resulting answer is the Wexford Starlight footage. I wasn't present for any of the filming since it would have hiked the cost by flying me in so Jack produced those segments himself. It was shot on VHS. It was then a matter of my cutting the new material into the final version. The Wexford Starlight closed in August 1989 and was demolished. The North Way Christian Community occupies that real estate today. DK: I noticed that Forry was interviewed at his famous Ackermansion. It's also where interview segments with Linnea Quigley and Bobbie Breese were filmed. How were you able to get them at the Ackermansion? TF: Forry was already a friend of Imagine, Inc. As the company's new owners, the first book we published was Forrest J Ackerman: Famous Monster of Filmland. Bob had it all laid out and ready for press, but his old partner wanted out so it was just sitting there waiting for us. When it came time for D-IM! he was happy to help and be a part of it. Such a nice and funny man. Linnea and Bobbie were also friends of Imagine. We all met at Forry's and it was me, Donald Farmer and his fine two man crew who shot the interviews for the price of a dinner afterward. Donald was a friend of mine who happened to be in Los Angeles doing some filming and he really did me a solid that day. I've never forgotten it. It was all taped in a matter of a few hours. Forry was his usual fantastic self through it all. Linnea and Bobbie are just wonderful folks to be around. They're gems. DK: You mentioned the D-IM! book, but as far as I know it never materialized. Were you involved with the book at all? TF: Oh yes, know it well. The D-IM! video, which we originally self-distributed on our own label, didn't solve the book problem. It helped assuage it, but it was still our 800-lb. gorilla. The rift with Bill George was something we wanted to smooth out. We were somewhat successful and to be entirely frank, I don't recall the exact level of goodwill that had been rebuilt. Bill always struck me as a fair and reasonable person. I specifically recall being with him at a book trade convention and speaking candidly about his concerns. I learned a few new things through that discussion. Permit me a second to digress. When Jack, Andy and I bought into the company, we also bought its debts and the strained relationship with Bill. One of the constant headaches was that Imagine could never catch up with its creditors. Money would come in and it had to be judiciously spent to service debt and still feed current expenses. I took over the spreadsheet during this time so I was very intimate with who was owed what and for how long. Bill was owed some money and he was further disgruntled that his book wasn't getting published. He was justifiably annoyed with Imagine, Inc. as were others who were waiting to be paid. So, here we were years since Bill finished his second book with us, only now its timely content had grown a thick beard. There finally came a point where one of us had to put this thing to rest once and for all. The crazy thing is that Bob, who is a good art director, had already begun laying the book out when it was first submitted; there was a near complete framework. Bob gave me every doggone thing he had on it and I took it all back to my house in New Jersey and began getting very intimate with its content. I never really studied the stuff before. What I learned was two things: The book was indeed dated and needed editing. Movies that were mentioned as coming had already been released and gone, that sort of stuff. The other was that Bill hadn't written the entire book. It was actually an assemblage of other authors' material unique to the book. Bill was more the editor than the sole author as I had thought. No big deal, but it came as a surprise to me. So I began with page one and did a complete overhaul. I added photos, wrote every caption, rewrote text ... the works. I enlisted my friend Eric Maché to become the new art director and work around Bob's established format. In the meantime, Bob had designed a new cover. Eric did a great job on pennies and we did finish it. I was going to take a co-editor credit on it because of all the work I put into it. Everything was looking good and D-IM! was 99.5% ready for publication, except Imagine had no money. It was late 1991 and I was getting tired of the strapped situation even though I loved working with this great group of friends. Also, my partners were seriously talking about organizing a Night of the Living Dead 25th Anniversary Reunion convention in Pittsburgh. I was totally against it; the lone dissenting voice based solely upon the exorbitant costs. Anyway, I sold my shares back to the corporation in exchange for cartons of company merchandise. We never got D-IM! to press. A few photocopied editions were made, one of which remains with me. My friends did pull off that convention in 1993 and it was a huge success for the fans, but not the financial success they had hoped it would be. Imagine, Inc. ceased as a company not too long after that. DK: Now we have a DVD release of Drive-In Madness! Can you tell us more about it? TF: After Imagine, Inc. folded, Jack retained the rights to D-IM! He also owned several straight-to-video titles that he produced away from Imagine in subsequent years. Sometime early in 2008 he sold all of his titles and their rights to Sub Rosa Studios in upstate New York. Jack has always been a principled man and a steadfast friend. He shared a percentage of the sale with me. It was the first time I had ever received a dime from making that video. It had been sold, licensed and re-licensed and we even did a 40-min. version that I called Screen Scaries. I even have a British VHS release of Screen Scaries. How that deal happened I'll never know. Anyway, in May 2008 Sub Rosa put D-IM! on DVD. The company was very kind and sent me a copy. It's identical in content to the original 84-min. 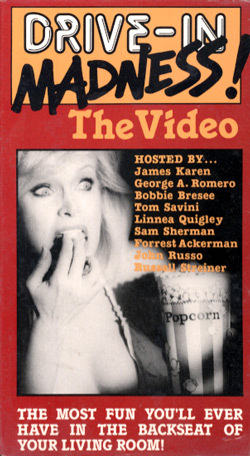 VHS version. DK: Are you still in contact with any of your former partners? email Tim Ferrante and your toenail fungus will be healed.